When people have the epiphany they possess too much ‘stuff’, it’s the first step. 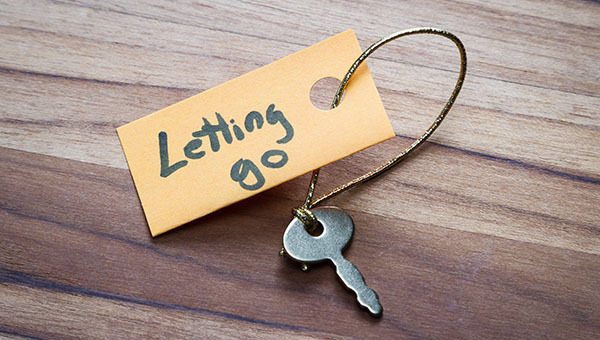 Then comes the hard part, what and how to let go? This is where it helps to change the thinking about your stuff. Be honest about where you’re at. If you don’t host the big family dinners anymore, you probably don’t have a need for huge platters and six sets of serving utensils. If you don’t every have time to read (except the occasional blog…) then reduce your bookshelf contents. Stop thinking about the $$$. How much you paid for something once upon a time doesn’t change the fact that it’s taking up space and being a barrier to move forward. If you’ve had use out of something then it’s served its purpose. If you never used it, own the mistake and move on. Don’t let guilt be a deciding factor. So many people want to hold onto things simply because someone gave it to them, regardless of the fact that they don’t have the space, it doesn’t suit their lifestyle, or it’s just plain ugly. The joy was had by choosing and purchasing the gift, then giving it to someone. Look at each item objectively and ask the question – do I need or love this??? If you don’t truly need it or love it…let it go.